The audience for this strategic connectivity plan includes authors, publishers and book reviewers. Self-published authors can use Twitter to enhance connectivity among other writers, publishers and indie book reviewers. By using Twitter to demonstrate their genuine interest in the writing industry by following other authors, indie book reviewers and publishing companies, writers can keep their finger on the pulse of what is new and upcoming in the industry and what readers want to hear about. Self-published authors can engage the community throughout the creative process by tweeting teasers about their upcoming work. Authors can position themselves as experts in their field by tweeting writing tips, advice for writers and news related to the publishing industry. This will thereby help writers build their brand. The most important advice for writers is to only tweet good and relevant content. Whether the author chooses to provide humor, writing advice or links to helpful information, they should stick with content that is valuable, and not tweet about their breakfast or trip to the store. As Alexis Grant, journalist and social media coach, said, “Whatever you do, make sure your Twitter feed is full of tweets we want to read—and not about how you’re late for your dentist appointment,” (2010). Dana Sitar with The Write Life advises that writers should follow the 80/20 rule with Twitter – meaning that authors should spend 80 percent of their time talking about others and 20 percent talking about themselves (2013). Find out how self-published authors can connect with other authors, publishers, indie book reviewers and key influencers in the industry. The audience for this strategic connectivity plan includes authors, publishers and indie book reviewers. Self-published authors use Twitter to connect with other authors and share writing tips and advice about the industry. Writers value the connectivity as writing is often a solitary pursuit. Writers support each other within the Twitter community and share tips. There is a mutually beneficial relationship between the author connectivity on Twitter, as new authors can seek advice and established writers can further position themselves as an industry expert by offering insight. Twitter can offer a virtual way to network, as well as a way to stay connected with writers one meets at a writer’s conference or other event. Dana Sitar, with The Writer Life, made a great point about how Twitter doesn’t sell books, but instead it helps authors make connections. Unlike other social media, like Facebook, Twitter is an open platform that encourages connecting rather than restricting views. This makes it a great choice for meeting new people and connecting with others in the community (Sitar, 2013). Twitter can help authors stay informed on what is going on in the publishing industry. One writer, Alexis Grant, talks about how she was able to able to stay up-to-date on what was going on at a popular writer’s conference – BookExpo America by following the hashtag #BEA09 (as cited in Ohi, 2013). Authors can also make contacts in the publishing industry. Many publishers are savvy with social media, and they have their own blog, tweet and have profiles on Facebook. They often use this media to find new talent. Publishers have their finger on the pulse of what is trending in literature. They can also provide resources and tips on how to get into bookstores and libraries. Agents will also tweet about what they are looking for in a query. Alexis Grant speaks about how using Twitter to connect with agents and publishers can help authors develop a personalized query, which will help get the agent’s attention, (2010). Self-published authors can greatly benefit from book reviews, as it offers publicity. Additionally, positive reviews can generate more readers. Major news publications do not typically review self-published books, even though more than 235,000 titles were self-published as of 2011, (Ricci, 2013). The New York Times finally reviewed one self-published author’s book for the first time in 2012, but not only is this not a common occurrence, it’s not likely to set a new trend. According to Charman-Anderson, most reviewers don’t want to deal with authors directly. They rely upon publishers to work with the publishers who can sort through the works that they believe the reviewers will be interested in (2012). Amy Edelman, founder of IndieReader, says that objective of IndieReader is to do just that…help readers find indie works that are worth reading (Edelman, 2012). IndieReader offers book reviews, for free, for self-published authors. There are numerous book bloggers and book reviewers who are looking for content to review. By working together, authors and book reviewers can have a mutually beneficial relationship. Book reviewers are looking for new content to read and enjoy receiving free books, while writers are looking for book reviewers to help promote their work. Writers can use Twitter to engage with book reviewers, such as @IndieReader, who could review their work. IndieReaders – IndieReader is a channel for self-published authors to find interested book reviewers to read and review their work. This forum connects writers with readers in a way that is mutually beneficial for both parties. @IndieReaders frequently tweets about the books that readers review (Edelman, 2014). Nanowrimo – Nanowrimo is a site designed for National Novel Writing Month, which is in November. Nanowrimo is a non-profit group that encourages participants to write a 50,000-word novel between November 1 and November 30 (NaNoWriMo, n.d.). However, the connectivity among authors goes on all year long. People talk year round in the forums on http://nanowrimo.org, Twitter, and Facebook. Jane Friedan – http://janefriedman.com – One of my favorite publishers, Jane Friedan, has an excellent blog and has taught many classes on how writers can promote their work through social media. Her blog titled Helping authors & publishers flourish in the digital age is a valuable source of information for writers and publishers alike. Friedan is an author, publisher and professor and she’s a key influencer in the industry. Rachelle Gardner – http://www.rachellegardner.com – Rachelle is publisher who maintains a blog to provide writers with tips for becoming a successful author. Amy Lynn Andrews – Andrews is an Internet self-published author of an ebook, Tell Your Time, a savvy blogger and she helps writers understand the process of using social media. She has tips for using Twitter, Top Twitter Tips, and engaging readers. She is one of my favorite influencers of social media because she makes it easy, simple and concise. She is impacting the community through the development of her Useletter, which is her own take on a newsletter. It’s full of useful tips for authors in an easy-to-digest format. Stephanie Sorkin – https://twitter.com/stephsorkin – Stephanie is an author of children’s books that focus on children with allergies. While her book, Nutley, the nut-free squirrel, focuses on food allergies, my book focuses on environmental allergies. Stephanie uses Twitter to engage her readers and I can learn from her social media strategies. The challenge for self-published authors in using Twitter is to create compelling content that engages the key audience. There are so many spammers that have cluttered the channel, that it makes it difficult to know who is authentic. While a well-intentioned author may want to truly engage with an audience on Twitter, all of the “noise” from spammers makes it difficult to know who to trust and who to ignore. It’s important for a self-published author to be authentic and genuinely interested in connecting with others. Inauthenticity will be discovered and admonished. The strength of Twitter is that it allows a self-published author to make connections with others across the globe in which they would have otherwise never been able to contact. Authors can also follow writer’s conferences in which they cannot attend, glean insight into a publisher’s preferences and connect with key influencers in the industry. This plan will evaluate how to ensure to use the right searches, hashtags and influencers to reach the key audience. It takes time to build a platform and engage an audience. Keep pursuing the craft and the plan. Don’t get discouraged. Authenticity is rewarded Be authentic and only engage in conversations in which you are genuinely interested. Don’t participate for the sole purpose to market your book. Enables a self-published author to make connections with others across the globe Reach out and make connections with other publishers, authors and key influencers. Retweet their content. I will use I will use Goffman’s (1959) sociological theory of impression management, framing, footing and face to create a strategic connectivity plan for authors to engage their audience through Twitter (Johansson, 2009). Impression Management Goffman (1959) says that impression management is the way that people use communication in a strategic manner in an effort to create their desired impression of themselves (Johansson, 2009). This includes both verbal and non-verbal communication. Goffman says that the verbal communications are easy to control, which allow the individual to create their desired impression. However, non-verbal communication is not as easy to control. Twitter will allow me to create a completely written impression, which will be easier to control than a face-to-face impression that includes non-verbal components. Framing Goffman (1959) explains framing as the relation of meaning. Basically, a frame is how other can understand the background information that’s pertinent to the conversation to help them understand the context for what is going on. Frames can also help set the expectation of events and they form our perception. Framing also helps individuals know whether something is “play” or the “real thing.” It also helps explain the background to people so they can interpret the ongoing conversation, (Johansson, 2009). The hashtags serve as “frames” for a self-published author to use Twitter. The hashtags set the context for the conversation and help the audience know the background for the topic. Face One’s face is their public self-image. It is what one uses to communicate and it is emotionally vested. The face is constantly negotiated while communicating, but both parties try to maintain each other’s face during the interaction. Ones face is intertwined with power and prestige. Goffman also speaks about the fact that relationships are not symmetrical. Power differences are often discovered during both face threatening and face saving acts, (Johansson, 2009). My Twitter handle @stacycacciatore is my public face and self-image. I should use my Twitter handle primarily for fueling this conversation around publishing and avoid other topics, as it will dilute my “face”. Footing Goffman (1959) says that footing is the concept is related to one’s position in a situation. The footing is divided into the animator, author and principal. The person delivering the message is the animator. The person who developed the content is the author, and the principal is the person behind the attitude and content of what is being said, (Johansson, 2009). When I create original content I will be the “author,” but when I retweet, I will be the animator. Goffman (1959) discusses both the front stage and back stage as part of the communication interaction. The front stage is what is presented to others that observe the interaction, while the backstage is where others come out of character (Johansson, 2009). Twitter allows the audience to view a sneak peek into the “backstage” of the writing process through the hashtag “wip”. August 3, 2014: Retweeted from ‏‪@TheRyanLanz What’s the best way to write conflict into your story? All analytics reflect a date range of July 1, 2014 – August 20, 2014. My potential reach with Twitter is 368,585. I have 836 followers and I’m following 943 people, which is a .89 followers/following ratio. I have sent 284 tweets within the date range stated above. My retweet rate is 5.63 percent. My tweets favorited percentage is 18.66 percent. I send an average of 5.46 tweets per day. All of my top “Users most mentioned” and “Users most replied to” include my fellow classmates, representing our integration on this topic. The hashtag I used the most was #658 create. Followed by #amwriting, #selfpublishing and #writetip. The most influential user that I follow is @DabneyPorte (fellow writer) and she has “mentioned” me twice. The tweet that received the most “favorites” was “what are the real goals for writers on social media? shr.lc/1klGENT #writerslife” representing that writers on Twitter want to understand how to use Twitter. I have 116 user mentions on Twitter and I have found that when I mention other users, they often reciprocate and mention me as well. Overall the analytics show me that my influence on Twitter is small and I have an opportunity to continue to grow my network through the strategies outlined in this plan. Follow key influencers in the writing community, publishing industry and book reviewing groups. I found I could not only connect with these individuals on Twitter, but also connected with them on LinkedIn to further my network. A great way to do this is to join writing groups within LinkedIn and use those forums to further your network. I also found that my network group substantially when I followed other key influencers throughout this process. I “unfollowed” 314 people throughout the process of creating the connectivity plan because I did not find their content relevant to my research. I had originally followed them a while back and then I discovered that my feeds were cluttered with spam or information that wasn’t relevant to my interests. I conducted a clean-up of who I followed and it made my Twitter feed much more relevant. I was thrilled to discover that I could follow the Los Angeles 2014 Society of Children’s Book Writers and Illustrators Conference even though I am not in LA and can’t attend the conference. The attendees of this conference used the hashtag #LA14SCBWI during the live conference on August 4, 2014 and shared coverage and updates. Following this conversation provided a great way to stay connected to what other authors were learning, hear from publishers and experts in the industry. I discovered two virtual writers conferences that will not only provide an opportunity for writers to focus on their craft, but they can obtain critiques on their work, connect with other writers and even have an opportunity to get picked up by a literary agent. November is National Novel Writing Month and NaNoWriMo holds a virtual conference/writing challenge each year. Writers can follow the conversation on Twitter using #NaNoWriMo and in the discussion forums on the NaNoWriMo site (NaNoWriMo, 2014). Writers can also sign up for #WriteOnCon, which will be held on August 26-27 (Harris, 2014). By following the conversation on Twitter and engaging on the site, writers can derive much of the same value they obtain from a writers conference for free. The #amwriting hashtag has been trending on Twitter consistently for the past eight weeks (Twitter). The metrics demonstrate that this hashtag has a potential reach of 18,475,280. According to Wise Ink, a creative publishing blog, an effective way for authors to use social media is to pay attention to trending topics to join a conversation. Wise Ink mentions that #amwriting has been trending and it’s a great way for authors to find other authors and network (WiseInkBlog, 2014). I would check the trending topics in Twitter each day to see what the community was discussing. One word of caution though, only join the conversation with a trending topic if you have something valuable to add to the conversation. Don’t artificially use the trending hashtag for the sole purpose of getting visibility. I did not have success with asking general questions to engage the writing community. I asked several questions of writers and used relevant hashtags to try to start a dialogue around key topics, but I did not receive responses. Share tweets that are a part of the “backstage” in the “frontstage” channel. This allows readers to have a preview into the working progress of writing a book. I make this recommendation because of the impression management concept within Goffman’s sociology. Impression management states that individuals use communication to create a desired impression of themselves (Johansson, 2009). I specifically looked at the notions of frontstage and backstage in this recommendation to create illusions and impressions of behind the scenes information. Specifically this recommendation is to provide information on the frontstage that is typically retained backstage (McArthur, 2014). Use the Twitter Hashtag #WIP, which stands for “Work In Progress” and #WriterWednesday. The #WriterWednesday hashtag should be used on Wednesdays. The #WIP hashtag can be used anytime. #WIP had 3,010 tweets and a potential reach of 4,520,338. #WriterWednesday had 1,034 tweets and a potential reach of 5,392,46. Make contacts in the publishing industry by following editors, publishers and book reviewers. I make this recommendation because of the impression management concept within Goffman’s sociology. I specifically evaluated face, which is something that can be maintained, enhanced and lost through interactions (Johansson, 2009). Because the concept of face is intertwined with power, prestige and ones’ public self-image, making connections is an important component of positive face. Maintaining a positive face is presenting oneself as desirable, and one can craft their public self-image as desirable, powerful and prestigious by associating with others who possess those qualities. The great thing about Twitter is that it allows one to make connections with others who have a powerful public “face” that otherwise couldn’t be forged. I connected with @JaneFriedan through Twitter, then on LinkedIn. Through following @JaneFriedan on Twitter and LinkedIn, I’m able to make additional connections in the industry. Follow key influencers, such as @KristinOstby, an editor with Simon & Schuster, @JaneFriedan, publishing industry expert and @goodreads, a community for book reviewers. I also recommend that authors connect with editors, publishers and book reviewers on LinkedIn. A great way to do this is to join writing groups within LinkedIn and use those forums to further your network. There are no timing implications. @JaneFriedan has 190,937 followers. She has been retweeted 1,428 times, which is a rate of 44.69 percent. She also has a rate of 48.36 percent of tweets favorited. @goodreads has 1,028,684 followers. They have been retweeted 975 times, which is a rate of 30.47 percent. They have a rate of 46 percent of tweets favorited. @KristinOstby has 1,350 followers. She has been retweeted 163 times, which is a rate of 5.10 percent. She also has a rate of 14.28 percent of tweets favorited. The tweeter should “frame” oneself as a writer by using specific hashtags. I make this recommendation because of the impression management concept within Goffman’s sociology. I specifically evaluated framing, which is an important concept that evaluates the lens through which information is presented (McArthur, 2014). The “frame” helps answer the question “what is it that’s going on here?” (as cited in Johansson, 2009, p.123). This ensures that the follower understands that the tweeter is coming from the vantage point of a writer. Additionally, the #amwriting hashtag has been trending on Twitter consistently for the past eight weeks (Twitter). The metrics demonstrate that this hashtag has a potential reach of 18,475,280. According to Wise Ink, a creative publishing blog, an effective way for authors to use social media is to pay attention to trending topics to join a conversation. Wise Ink mentions that #amwriting has been trending and it’s a great way for authors to find other authors and network (WiseInkBlog, 2014). The #amwriting hashtag can be used any day of the week and is not sensitive to timing. The #amwriting hashtag has been tweeted 3,020 times and has a potential reach of 18,475,280. Use hashtags that identify the tweeter as an independent, self-published author. The writing community supports other “indie” authors and there is a strong sense of community and connectivity among this group. Share content in which you are not the original creator and provide credit to the original “author”. I make this recommendation because of the footing concept within Goffman’s sociology. Footing is the overlapping roles of the author, animator, and principal (McArthur, 2014). his method combines all three “footing” roles to allow for a complimentary overlap. The source of inspiration is the “principal” because that is where the concept originated. The tweeter is the “author” because he/she is designing content to support the original author’s contributions. The tweeter is also the “animator” because he/she is delivering the message through Twitter. The goal is for followers to retweet the content, which would also put the follower in the “animator” role. I found success when I retweeted content from key influencers. One of the key influencers in my network is @katemwhite, New York Times bestselling author and former Editor-in-Chief at Cosmopolitan I retweeted one of her great tweets with writing advice and she replied to my retweet. This resulted in my gaining additional followers. Retweet and share content from key influencers. Use hashtags such as #writerinspiration to share quotes or inspirational information that was created by another individual, but add your own thoughts to contribute to the value of the information. Kate White has 12,267 followers, giving her great reach. Kate White retweeted me on August 13 and I obtained 12 additional followers that day, following her mention. Share tips and inspiration for what helps you, as a writer. Truly engage the writing community and “pay it forward” by offering advice and support. I make this recommendation because of the face concept within Goffman’s sociology. Face is “the negotiation of positive and negative face between communicators,” (McArthur, 2014, p. 42). By tweeting original content, using the hashtag #writetip, the tweeter establishes him/herself as a writing expert. This contributes to the tweeter’s image as a writer. By providing tips the other writers, the tweeter is helping other writers and contributing to their prestige and image. The hashtag #writetip as the potential reach of 30,941,666 and has 3,069 tweets. Join the community of writers by joining virtual writing conferences. I make this recommendation because of the impression management concept within Goffman’s sociology. By joining an online writing community and sharing information real-time about the conference, one is sharing information that could be “backstage” on the “frontstage” which gives followers a feeling of inclusion. Additionally, by joining an online writing community and sharing information real-time about the conference, one is sharing information that could be “backstage” on the “frontstage” which gives followers a feeling of inclusion. I followed the hashtag #LA14SCBWI during my content curation stage of this project, which stands for “Los Angeles 2014 Society of Children’s Book Writers and Illustrators Conference” even though I am not in LA and didn’t attend the conference. Through Twitter, I was able to follow the conference and obtain excellent information from what was being shared in the conference. Post on online writing communities discussion forums and use the writing conference hashtags on Twitter, such as #WriteOnCon, #NaNoWriMo and #LA14SCBWI. Writers should use #NaNoWriMo in November during National Novel Writing Month (NaNoWriMo, 2013). Writers should use #WriteOnCon during August, which is on August 26-27 (Harris, 2014). Writers used #LA14SCBWI during the live conference on August 4, 2014. WriteOnCon website, NaNoWriMo website and Twitter. The first WriteOnCon writer’s conference in 2010 had over 11,000 attendees (Lodge, 2010). The hashtag #WriteOnCon has 163 tweets and has the potential reach of 192,042. The hashtag #NaNoWriMo has 223 tweets and has the potential reach of 751,278. The hashtag #LA14SCBWI had 209 tweets and has the potential reach of 951,295. Throughout the process of creating a connectivity plan for self-published authors to engage with authors, book publishers and indie book reviewers I learned quite a bit about community and connectivity. I used a variety of communication tactics to engage and connect with these audiences. I experimented with a variety of communication tactics, ranging from sharing content that would benefit other writers, tweeting original content, participating in existing communities that were trending on Twitter and asking questions to start a conversation. While the strategies and tactics varied, one common thread was discovered: authenticity is key. One must have a genuine interest in the community and furthering the knowledge, expertise and connections among the members to be successful. One must hang up the old notion that “success” comes in the form of sales of books and adopt a new definition for success, which is connecting with your audience. An author should build relationships with other authors, book reviewers and publishers without asking for anything in return. It is important to connect with this community and build relationships. I found that the Twitter community could sniff out inauthenticity. If an author is using Twitter only to sell his/her own books, obtain loads of followers or ask for book reviews, he/she will not be successful. An author should first ask what they could do to add value of the community and then share in the collective experience rather than approach using Twitter as a way to get others to help him/her. The great benefit to Twitter is that valuable, mutually beneficial relationships can be formed. There are numerous reader communities who are seeking books to review and there are many authors who are seeking readers. Through using a social media channel, such as Twitter, these groups can find each other and help each other achieve their goals. If the author conducts research to find the right individuals to connect with, the relevant conversations to follow and useful hashtags to curate content, in conjunction with discovering how they can add value to the community, that is the formula to obtaining collective success among the writing community. Building Blocks for a Healthy Future (n.d.). Choosing the Right Books in the Classroom. Retrieved from http://bblocks.samhsa.gov/educators/lesson_plans/choosing_right_books_classroom.aspx. Burnett, M. (2013, Apr. 23). Changes and Trends in Children’s and YA Publishing: An ABPA Panel. Publishers Weekly. Retrieved from http://www.publishersweekly.com/pw/by-topic/childrens/childrens-industry-news/article/56933-changes-and-trends-in-children-s-and-ya-publishing-an-abpa-panel.html. Charman, A. (2012, December 6). The New York Times Reviews Self-Published Book. Forbes. Retrieved from http://www.forbes.com/sites/suwcharmananderson/2012/12/06/new-york-times-reviews-self-published-book/. Common Core State Standards Initiative (n.d.) What Parents Should Know. Retrieved from http://www.corestandards.org/what-parents-should-know/. Common Core State Standards Initiative (n.d.) Frequently Asked Questions. Retrieved from http://www.corestandards.org/about-the-standards/frequently-asked-questions/#faq-2298. Edelman, A. (2012, December 7). The New York Times (Finally!) reviews a self-published book. Huffington Post. Retrieved from http://www.huffingtonpost.com/amy-edelman/the-new-york-times-finall_b_2251517.html. Grant A. (2010, October 28). How writers can use Twitter for networking and success. Writers Digest. Retrieved from http://www.writersdigest.com/editor-blogs/guide-to-literary-agents/how-writers-can-use-twitter-for-networking-and-success. Harris, C. (2014, July 22). Never fear…WriteOnCon 2014 is here. WriteOnCon. Retrieved from http://writeoncon.com. Hudson, H. T. (n.d.). 25 Best Websites for Teachers. Scholastic. Retrieved from http://www.scholastic.com/teachers/article/25-best-websites-teachers. Liu, C. (Keynote Speaker). (2013, September 28). Proceedings from Society of Children’s Book Writers and Illustrators (SCBWI) Carolinas Writers Conference 2013. Charlotte, NC. Lodge, S. (2010, August 19). Aspiring authors attend WriteOnCon conference—at home. Publishers Weekly. Retrieved from http://www.publishersweekly.com/pw/by-topic/childrens/childrens-industry-news/article/44204-aspiring-authors-attend-writeoncon-conference-at-home.html. Moms on Social Media: a Marketing Opportunity (2013, July 31). GoRational. Retrieved from http://gorational.com/blog/article/354. NaNoWriMo (2013). How it works. NaNoWriMo. Retrieved from http://nanowrimo.org/how-it-works. Publisher’s Weekly (2011, January 31). What Do Children’s Book Consumers Want? Retrieved from http://www.publishersweekly.com/pw/by-topic/childrens/childrens-industry-news/article/45943-what-do-children-s-book-consumers-want.html. Ohi, D. (2013). Twitter guide for authors and illustrators. Inkygirl. Retrieved from http://inkygirl.com/a-writers-guide-to-twitter/the-basics/. Ricci, S. (2013, June 19). The Shifting Landscape of Book Reviews. Huffington Post. Retrieved from http://www.huffingtonpost.com/2013/06/19/self-published-book-reviews_n_3467890.html. Sitar, D. (2013, September 25). Why writers should love Twitter (Hint: It’s not just about selling books). The Write Life. Retrieved from http://thewritelife.com/why-writers-should-love-twitter-hint-its-not-just-about-selling-books/. Twitonomy (n.d.). Retrieved from www.twitonomy.com. Quenqua, D. (2012, May 11). Moms 61% More Likely to Visit Pinterest. Clickz. Retrieved from http://www.clickz.com/clickz/news/2174264/moms-61-visit-pinterest. Wise, Ink (2014, April 28). Join the conversation: The art of following trends. WiseInk. Retrieved from http://www.wiseinkblog.com/social-media-2/2781/. All metrics are pulled from the date range of July 1, 2014 to August 20, 2014 using twitonomy. I find the concept of knowledge mining fascinating and exciting. According to Nussbaum (2013) “knowledge mining” is important because it allows one to combine, mix and “mashup” several different experiences into one new learning experience. Nussbaum introduces the concept by giving an example of how Apple founder, Steve Jobs, “mashed up” the concepts of calligraphy and programming when creating the Mac. This is a perfect example of how two completely unrelated topics resulted in creating something new, innovative and valuable. Nussbaum (2013) says “you’re not born with the great ability to connect dots. You learn it,” (p. 62). I couldn’t agree more, as I find it challenging to connect the dots, even though this is a buzzword phrase that my employer uses frequently. One of the required skillsets for many roles at my company is an ability to “connect the dots” but certainly those “dots” can vary. My “dots” include running, lifting weights, cross-stitching, Tetris, cooking, writing, corporate communications, ‘80s children’s books and Disney. How do those dots connect? It’s interesting because there are definitely times I see crossover in my interests and I’m able to connect the dots between my hobbies and professional interests. Nussbaum (2013) describes “donut knowledge” as “the ability to see what isn’t there,” (p. 67). In my experience, working in corporate communications requires a lot of “donut knowledge”. I must always think about issues and questions that don’t currently exist. An example I just encountered today was writing a sensitive communication regarding an information security incident that occurred at a peer company. I had to anticipate what questions we may receive at my company and see what wasn’t there. If we say, “we haven’t yet experienced any issues as a result of this event,” are we communicating that we haven’t “yet” experienced a problem, but we may? Will that cause more questions regarding our vulnerability? If I say, “as a result of this event” does that lead the reader to believe that we are experiencing issues, but not just due to this event? I must always think about what I’m saying with the words I’m not saying and employ “donut knowledge” to see questions, concerns and issues that may not be there. My “magic circles” include my classmates in this program. I am surrounded by extremely talented individuals and I’m lucky to learn from their experiences and wisdom. Just as Nussbaum (2013) says, a donut knowledge strategy is to “bird the birders”, which is an analogy for surrounding oneself with those better than they are. I feel like I’m around those more talented than I in this program. Additionally, I am attending a SCBWI (Society of Children’s Books Writers and Illustrators) conference this fall to “bird the birders” and be surrounded by other writers, publishers, agents and those in the industry that are extremely talented. The conversations that those are having in these circles are about the changing industry of children’s book publishing, the effect of Common Core on children’s books and the challenges of being published in traditional publishing houses. By collaborating with others in the industry, we are able to learn from each other and leverage best practices. I plan to knowledge mine as it relates to my connectivity topic (how a children’s book author can promote his/her work through Twitter) by following existing conversations on Twitter on publishing, promoting and writing. I plan to join in on Twitter conversations, visit SCBWI forums and speak with other writers. I also can use my experience in both my hobbies and professional background to help connect the dots and bring my own personal experience to the table, so I can find how I can make a difference, personally. As a result of this class, I’ve signed up for the SCBWI writer’s conference this fall so I can continue to learn from industry professionals and further my knowledge in this area. I’m excited to learn more. Nussbaum (2013) says that our beliefs about the world are influenced by “frames”, in which we may or may not be aware. Gregory Bateson, a British anthropologist, studied monkeys within his sociology field of research. He developed the term “frame” based on the set of expectations that monkeys display to signal if their behavior is “play” or “fight” (as cited in Nussbaum, 2013, p.88). Nussbaum provides a great example of the application of a “frame” based on Picasso’s redefinition of what is considered art. During Picasso’s time, one didn’t think of “art” in the deconstructed manner in which Picasso composed. He literally reframed art by influencing what is frame-worthy. In today’s world, there are many “frames” that we work within, whether we realize it or not. Just today I was interviewing a candidate for a role on my team and he had an extensive background in creative roles at companies such as Marvel. He had even written a comic book for children suffering from a life-threatening illness to help them find relatable ways to understand their illness. The amount of creativity in that role is tremendous and I was in awe of his experience, however my question for him was “would he feel limited in creativity given the restrictive frame at our company? As Nussbaum (2013) provided the experience of the students reframing the chemo experience, one should take the key stakeholders viewpoint and experience into consideration. I would recommend conducting a focus group to truly understand the reality. One can create a new frame only if they understand the reality of the current frame. Nussbaum, B. (2013). Creative intelligence: Harnessing the power to create, connect, and inspire. New York: Harper-Collins. Knowledge mining (pp. 43-83) & Framing (pp. 84-115). Kelley, T. and Kelley, D. (2013). Creative confidence: Unleashing the creative potential in us all. Pages 94-103. I was excited for this assignment, but I was overwhelmed with the possibilities’. Did I want to use my daughter’s old clothes to make a blanket? Take a pair of my son’s jeans and make a purse? What about using some of my used applesauce jars? However, the piece of the assignment I focused on was taking trash and making something useful. I also wanted to use trash that was meaningful to me: that is when the record clock was born. I used an old Christmas record, which is definitely trash because I don’t even have a record player. On the record, my lucky number “222” appears (my birthday is February 22). The record is meaningful to me because Christmas is my absolute favorite time of year and I have my Christmas gingerbread man on display all year long. My kids and I then went to the playroom and scoured through all of the odds and ends that we were going to throw away to find trash to turn into treasure. 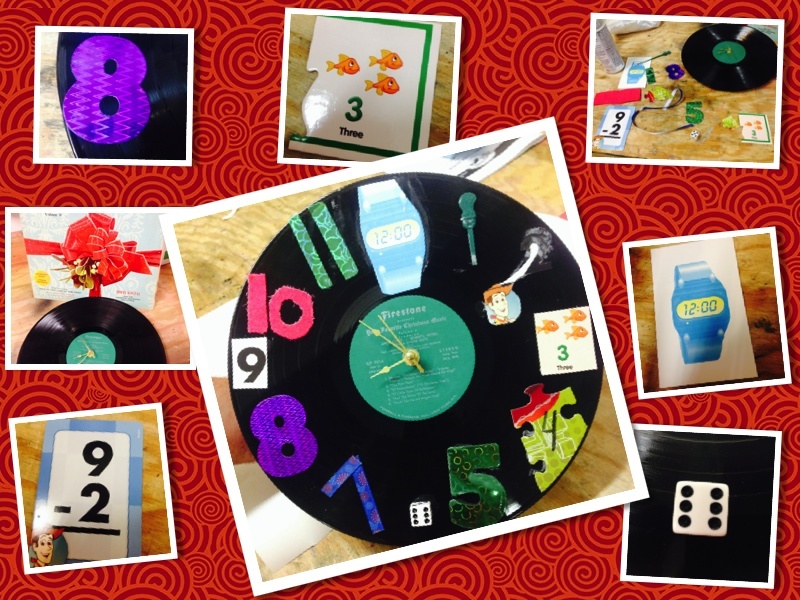 I made each number on the clock with something that was meaningful to my kids and I. 2: My kids and I favorite movie of all time is Toy Story! This number two came from a Toy Story flash card. I made sure to leave Woody on the number to add fun. 3: The three came from a Leap Frog learning game that I play with my daughter. 4: The number four is from a Toy Story puzzle, which is our favorite movie. 5: We used this glittery number five on our Girl Scout World Thinking Day poster with my Girl Scout troop. 6: This die came from my daughter’s favorite game: Mouse Trap. 7: The ribbon I used to make the seven came from ribbons I bought to make my daughter’s Fourth of July bow. 8: My son used the same number eight with his school project on Egypt’s tomb. 9: The nine came from math flash cards I do with both of my kids. 10: The felt used to craft the number 10 came from a Christmas craft that my daughter and I did together. 11: We used the material from the 11 in a poster for the Christmas parade. 12: The 12:00 watch is from a flashcard used to teach time that my daughter and I use. This was a fun activity that really sparked my creativity. My entire family got in on the action. My husband helped install the clock, my son helped me cut out the numbers and my daughter helped me adhere the numbers to the record. We will definitely use this creation in my home, not only as a clock , but also as a decoration for our movie room. We were looking for interesting retro decorations for our movie room and this fits the bill! This could also be used as a teaching tool for children to help them learn to tell time. This project definitely helped me think of creative ways to use unrelated items. I also had to learn to let go of my perfectionism. This was purely an experiment in creativity and not designed to create a perfect product. In a way that was completely freeing because I could focus on creating , rather than the end result. Has anyone ever tried to turn a craft or hobby into a business? Did you find this to work well for you or did you feel your creativity was constrained by the “business” of creating? Godin (2013) discusses both what art is and what it isn’t during his interview with Nido Qubein. Godin provides an example of how a painter isn’t an “artist” if she stores her paintings in the attic away from the world to see. But, a nurse, who provides the best care for her patient, with strategies not outlined in a manual, is performing art. In The Icarus Deception Godin (2012) says, “Art isn’t something that’s made by artists. Artists are people who make art,” (location 186). Godin’s description of art completely turns the classic definition on its’ head. When one thinks of an “artist” one often thinks of one who paints, sculpts or crafts. One doesn’t think of a medial professional, a lawyer or a corporate executive. But this is exactly who Godin proposes is an artist, especially in the connected age. When speaking about the connected age, Godin says that originality and art are not a choice. He speaks about how we must move out of our comfort zone into the new safety zone and do this through art. Honestly, I had never thought of art in this way before. However, upon listening to Godwin and reading his viewpoint on art, I have to agree with him. I previously thought of being an artist in a conventional way. However, I agree that art is truly being creative, thinking outside the box and crafting a new way of doing things. I also agree that for us to have a competitive edge, especially in this global economy with competitors in China, we must capitalize on our creative and artistic abilities. However, I disagree with Godin (2013) on his viewpoint of employees at General Motors being at “fault” for losing their jobs. Godin (2012) speaks about how industrial organizational models have shaped organizations’ and individual’s ability to create art and innovate through standardization. Godin says that in the industrial age corporates are more focuses on processes, productivity and profits. Godin (2012) believes that this standardization has hindered our ability to make art. He makes the correlation between the phrase “better safe than sorry” and “better sorry than safe,” (location 547). Godin says that in the industrial age, we held the viewpoint that it was better to be safe than sorry, but he argues that being safe won’t generate growth. In my opinion, those around me who are creating art are many of my favorite authors of both traditional books and blogs. Jennifer Weiner and Jennifer Lancaster are artists and creative authors who are breaking new ground. They are terrific authors and each of them has challenged the formula for writing a book. Jennifer Lancaster is the author of many popular autobiographies. Typically autobiographies are only popular if the author is famous or has a truly amazing story. Lancaster was able to turn a life event, losing her job after the dot com bust, and turn it into a successful career as a writer. Jennifer Weiner is challenging the notion of “chick lit” as she writes engaging stories that are written with women heroines, but apply to all audiences. Each of these authors are creative and amazing at how they craft their story. When I reflected upon what Godin (2013) said about permission marketing, “People who earn the privilege of delivering anticipated, personal and relevant messages to people who want to get them. Those people are going to have power moving forward,” (High Point University, 2013) I also thought about some of my favorite bloggers, including Chocolate Covered Katie and Pioneer Woman. Both of these bloggers develop new recipes, take beautiful photographs and deliver content that readers want. There are multitudes of recipe blogs on the Internet, so the fact that both of these authors are able to deliver innovative content that readers want to receive is amazing. I aspire to have the same success with my blog. What is your experience with art and innovation in the corporate environment? Do you agree with my assessment that creativity is not rewarded in the corporate workplace? High Point University. (2013, August 10). HPU: Seth Godin and Nido Qubein [Video File]. Retrieved from https://www.youtube.com/watch?v=OdAneWA-jng. Godin, S. (2012). The Icarus deception: How high will you fly? (Kindle iPad version) Retrieved from Amazon.com.